Anyone who has considered purchasing a Nightforce scope inevitably asks: “Which one best suits my application — NXS or Benchrest model?” Shooters also ask: “Why is there such a price difference between the NXS and Benchrest (BR) models?” This article compares the features of the two models (NXS and BR), and provides some guidelines for choosing the right Nightforce scope for your needs. The NXS line is priced a bit higher, costing about 40% more than the comparable Benchrest model. NXS scopes are also a bit more robust, and feature a side parallax adjustment (side-focus), whereas the BR scopes have an adjustable front objective for correcting parallax. Another main difference is click value, as the BR scopes have 1/8 MOA clicks while the NXS scopes currently feature 1/4 MOA clicks. The “zero-stop” feature is something to consider as well, as it is only available on the NXS models and allows the shooter to quickly spin the elevation turret back down to a close range zero, usually 100 yards, without counting clicks. The tighter 1/8 MOA click value is generally more desirable for long range shooting as eighth-minute clicks allow the shooter to adjust Point of Impact more precisely than quarter-minute clicks. The 1/4 MOA clicks are worth about 2.6? at 1000 yards, while a 1/8 MOA click will move your POI only 1.3? at 1000. It is easy to see why the 1/8 MOA click value may be preferable when trying to dial in on a 3-5 inch X-Ring or 10-Ring. This is one reason why so many F-Classers favor eighth-minute clicks. The F-Class X-ring is just 5? in diameter. If you wanted 1/8 MOA clicks, it used to be that you had to choose the Nightforce BR model. That has changed. 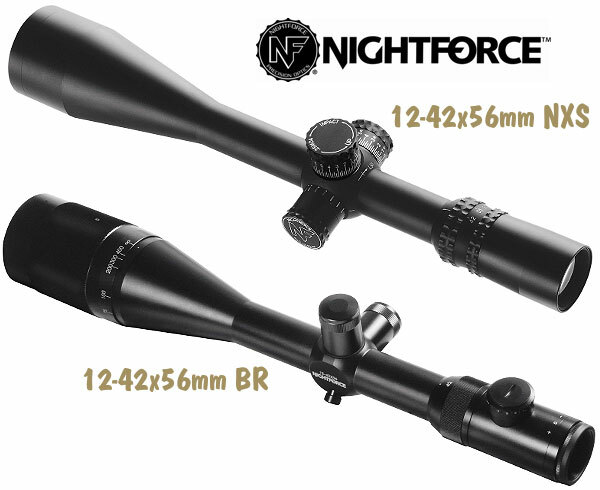 Nightforce now offers 8-32X and 12-42X NXS models with 1/8 MOA clicks. The 1/8 MOA-click NXS lineup is ideal for those who prefer side-parallax control AND more precise click values. Another consideration regarding click value is the availability of milrad clicks. “Mil” clicks are desirable when the scope has a mildot or MLR reticle, or similar reticle based on a milradian scale. Mil clicks are only available on NXS scopes at this time. Durability is not usually an issue with target shooters as the scope will mainly be used in benign environment on a fixed-distance range. So, as long as a scope tracks and performs reliably, most target shooters won’t fret about durability. For those that may use their rifles in a tactical or field situation, or when hunting, the added robustness of the NXS scope may prove quite important. Now the BR scopes are no slouch as far as durability compared to similar scopes, but, in my experience, they cannot take quite the abuse that the NXS scopes can. As far as the side parallax adjust vs. adjustable objective, this usually boils down to personal preference. The side-focus parallax adjustment NXS model fits one additional focus lens in the scope body — a lens not required in the front-adjusting Benchrest model. According to Nightforce, this one extra lens in the NXS can reduce potential light transmission by 1.0 to 1.5 percent in the NXS compared to the BR model. However, most human eyes will not notice the difference, and overall resolution should be virtually the same. The side-focus NXS models will be much more convenient from a prone position than will the BR scopes as it is not necessary to reach out of position to correct parallax. The BR scopes tend to be more convenient in fixed distance environments like benchrest or F-class, where there tends to be multiple shots at a similar distance, or there is plenty of time to adjust parallax. Compared to the NXS models, the BR scopes use more movement to produce the same amount of parallax adjustment — so you can say the BR offers “finer” adjustment. By contrast, the NXS side-focus delivers a coarser yet quicker adjustment requiring less movement to “dial-in” minimal parallax. Another point of consideration is the availability of a “zero-stop.” This is particularly useful in the same situations that the NXS scopes make the most sense. Namely, tactical or field situations where there may be stress combined with longer shots where dialing the turrets is required. The zero stop allows the shooter to set a stop point, usually a 100-yard zero. Then no matter where the turret is positioned in its span of travel, the zero can be quickly re-established by spinning the turret down until it stops at the pre-set zero. 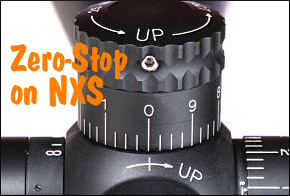 At present, the Zero-stop is available on all Nightforce variable NXS models except the 12-42×56. So you CAN get the zero-stop on the 8-32 NXS, but not the 12-42 NXS. With the new 1/8 MOA-click NXS models now available, the decision on which Nightforce scope to buy, will come down to focus/parallax adjustment, field hardiness, and price. Though it may still be a hard decision in certain situations, hopefully this discussion has made the decision a bit easier. All in all, Nightforce scopes are a great value and they offer enough choices to satisfy nearly all shooting situations. Nightforce Scopes can be purchased through EuroOptic.com and other Nightforce dealers.